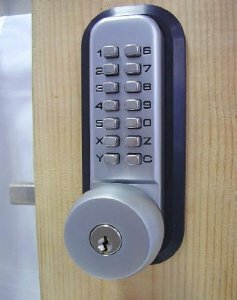 Easy to operate door knob handle & lever design. Includes installation instructions & hardware, door templates, 2 keys and operating instructions. Fits doors up to 1-7/8" thick 2-Position Backset Latch: 2-3/4" & 2-3/8" Deadbolt Throw: 1" Cutout Size (diameter): 2-1/8" with additional 8mm hole drilled for top bolt. Fits both Left-Hand & Right-Hand door types - 2-Position Backset Latch: 2-3/4" & 2-3/8"